I love Meanderings and Muses. And I love that each and every post gives me something - a little gift of something - be it a bit of new knowledge, a story that makes me laugh, or one that makes me cry. Or one that causes me to think. And I hope it does a little of that for many of you as well. The last post was from Hank Phillippi Ryan about Paul Simon and it has resonated with many of us. She said, "“Hello, darkness, my old friend?” Yikes. Paul Simon got me. And didn’t let go. And the idea of lyrics as literature, lyrics as poetry, lyrics as just as gorgeous and complicated and compelling as any good novel—began to evolve in my head." (does this give us a hint as to why Hank is an Agatha, Anthony AND Macavity winner?). Her piece collected lots of comments and it touched those of us who are lovers of words - which would be most of us who hang out here. And, as coincidences tend to happen, it came on the heels of something Janet Rudolph mentioned in a comment a couple weeks ago. 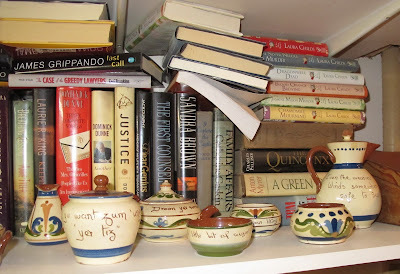 I wrote a piece here about Collecting Books . . . and other stuff. I included some pictures of some of my books. 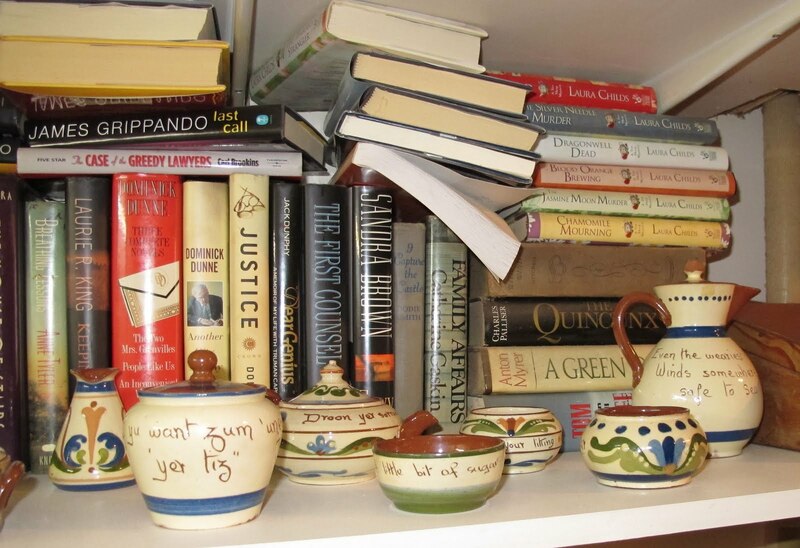 Janet, being a collector, noticed not necessarily the books, but the mottoware on the shelves along with the books. Seems she has several boxes of it herself. In her garage (I could cry. Suffice to say, I covet those 20 boxes, sight unseen). Janet collects " . . . embroideries, americana, and signs - anything you can read." 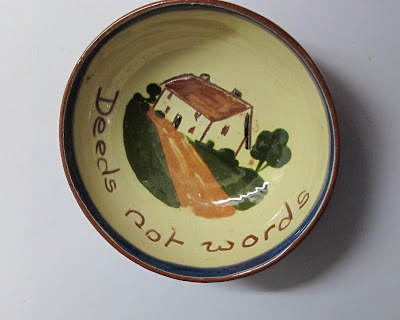 Is THAT what draws me to the mottoware?! WHY wasn't I able to figure that out on my own?! Thank you, Janet, for helping this feeble minded one figure out that one of the things she collects is "words." If we love beautifully written song lyrics and amass large collections of CDs, we're collecting words. If we're collectors of books, we're collecting words. How many times have we heard ourselves say "I love words." Or, "I love that word." Often, I'm betting. And while we're reading, how many of us will smile and sigh at the manner in which a particular phrase has been written. It might set our emotions rolling towards fear or anger or it might tinkle gentle bells of happiness in our hearts. Believe it or not, reading this little dish is what forced me to quit talking about joining an exercise class and actually getting off my lazy bum and doing it. Sometimes the words will remind you that it's the deeds that really might be important. Words weren't helping me lose any weight - that's for sure. And, like this piece tells me - "Lost Time is Never Found." So get on with it, already! I love words that say exactly what they are - know what I mean? You read or say the word shimmer and you just see and feel and know what it is. So, how 'bout you, wordsmiths, tell us some words you love - or hate. dazzle, quirky, saffron . . .
My favorites are "woids" -- simple ones that by force of luck -- have been "retaught" to me in different parts of the world. The soup in Virginia was the soap of North Dakota. Truly the best were offered at my eldest daughter's graduation party by our guest from Japan: "Oh! I bring you pleasants and many congladulations!" No buts in how I feel about you, my friend! Love all the way. Words are food for our souls. As you pointed out, words can make you happy, sad, angry, oh so many emotions. You mentioned lyrics as literature. One of my high school English teacher taught her class based on the songs of Neil Diamond. Words are a wonderful thing, just as you are my friend. Great post. Favorite word? Just one? Nah, not for a librarian who loves serendipity, adores shimmer and can't live without the miscellaneous in life, it ignites my imagination! "Oh, I do so love you Pooh", not the exact quote but close, written in a circle around a plate with Christopher Robin and Pooh in the Centre. Brings me happiness whenever I think of It. Thanks for your post for it brought back this memory. Sam! Yes! Serendipity is such a great word - I love it too. Molly - this is a hoot! Although I think I want to steal "Oh! I bring you pleasants." I love that! oh MJ - Thank you. I love you back, my friend. That "but" can be quite dangerous, huh? Vicki - what a delightful idea! I love this. And what great words these are. Twilight. There's something quite lovely about "twilight." "food for our souls." Mason, that is wonderful! I like this idea about your teacher and Neil Diamond - what a smart cookie! Hank - girl, you crack me up. Now that song "I'm just mad about saffron" is going to be bouncing around in my head all day. oy. dammit - there was a terrific post here by Andi S. and now it's gone, and no - it's not the one "deleted by author." I need to see if she'll come back and leave it again and hope that Blogger doesn't eat it again. dern. Patty - you know what? I was thinking of you while I wrote this. With all the wonderful quotes you share with us at Facebook - I knew you were one I could safely put in the "word collector" category. oh, Diane - I would love that plate. WHAT a treasure! What I marvel at is the ability of humans to instantly connect a word with a feeling or a sight. And we have all these fabulous words just waiting in our brains to be paired - in a split second - with our experiences. Great post, Kaye! I agree, words that sound like their meaning are terrific. 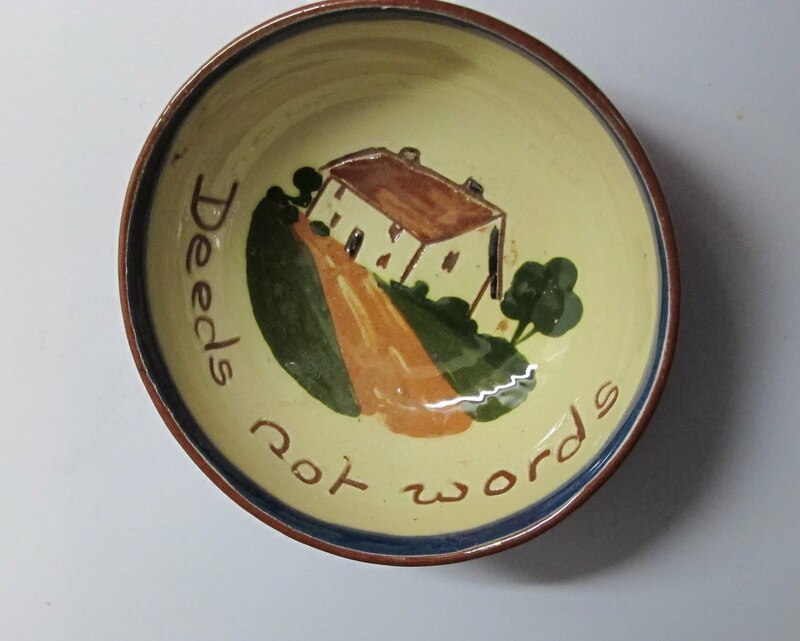 We don't have any mottoware but something that probably would be called sloganware: shallow ivory bowls with "Votes For Women" written in blue around the rim. I love words so much that one of my favorite pastimes is looking up the origins, like the origin of the word, "lunch." Try it, you'll like it. I don't know how to tell you this but I posted the same thing TWICE and it was apparently removed or not saved. Twice. I wish i could offer to write it up again but Kaye? Something is very werid. Andi - I know! I have no idea what's going on with your comments and it's making me crazy! I saw them 'cause they popped into my email, but they didn't show up here. Very very weird. And it was a GREAT story!! waahh. Thanks for trying, sweetie! Bobbi - I agree!!! Especially when those humans are very small children. Amazing. Brenda - ooooh - your "votes for women" dishes sound divine!! Mimja - such a Fun Thing!!!! We have dictionary and a thesaurus in every room in the house and never miss an opportunity to use them. Curiosity is a lovely thing. I just love this post, Kaye. There are so many words in the world that I treasure. I'm also a big fun of "hug." It makes me smile and it simple sounds warm, doesn't it? And "bugger." I'm not sure why this word has always elicited giggles from me, but it does. Jen - you made me laugh out loud! Finding some good words at WordScraper sends me into a Happy Dance. for real. Even if no points are involved. (Let's try for discombulated - that is SUCH a great word!). Lesa! This is wonderful! I would read these books for the titles - absolutely. Here's a title that captured me - "Angry Housewives Eating Bon Bons," and I've been a Lorna Landvik fan ever since. You're right, Kaye. I picked up that book because of the title, too. And, it lived up to the title! I read "quintessential" today--one of those words I love. :) I've enjoyed reading everyone's.